Mother Nature giveth. Father Time taketh away. Until now. 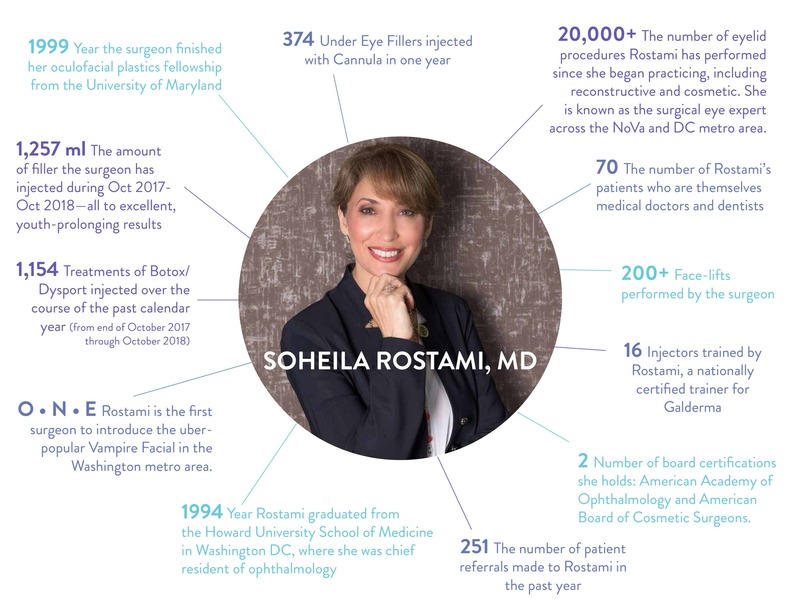 Meet Soheila Rostami, MD—turning back the hands of time and leading you gracefully to the fountain of youth so you can put your best face forward (selfie status, check! )—with natural-looking results. Here, scoop our by-the-numbers look at NoVa Sanctuary Cosmetic Center’s double board-certified oculofacial plastic surgeon and what makes her one of the best in the biz. 374 Under Eye Filler injected with Cannula in one year. 2 Number of board certifications she holds: American Academy of Ophthalmology and American Board of Cosmetic Surgeons. O ∙ N ∙ E Rostami is the first surgeon to introduce the uber-popular Vampire Facial in the Washington metro area. 20,000+ The number of eyelid procedures Rostami has performed since she began practicing, including reconstructive and cosmetic. She is known as the surgical eye expert across the NoVa and DC metro area. 1,154 Treatments of Botox/Dysport injected over the course of the past calendar year (from end of October 2017 through October 2018).